Today’s recipe is so decadent, you will want to eat it straight from the jar (I may or may not have done this). Seriously, you have to try Homemade Slow Cooker Dulce de Leche. It’s so good, but so addicting, that I’m afraid you might hold it against me (please don’t!). This caramelly (that’s a word, right?) goodness pairs well with many foods. I’ve served Dulce de Leche with sliced fruit, over ice cream, stirred into coffee and made into homemade coffee creamer (recipe coming soon). It’s also quite possible I’ve eaten it straight from the jar with a spoon (for quality control purposes only, I assure you!). You’ll only need a few items to make this creamy, delicious sauce: sweetened condensed milk, canning jars, water and a slow cooker. It really couldn’t be any easier. 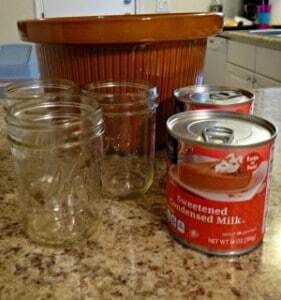 After dividing the milk between 3 canning jars, place in your slow cooker. Cover and cook on low for 8-10 hours. 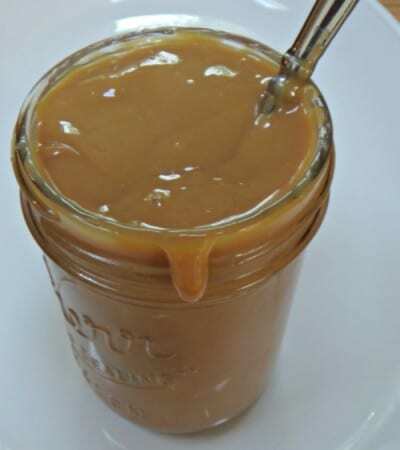 Check your jars, and when the milk changes to a lovely, caramel color, your Dulce de Leche is done. Carefully remove the jars from the slow cooker (they will be very hot) and place on a towel on the counter top to cool. When cooled, pop the top and lid off one of the jars and grab a spoonful to taste. It is perfectly acceptable to do this because you MUST perform quality control before offering this goodness to your family. Equally divide the contents of the 2 cans of sweetened condensed milk between the 3 canning jars, leaving about 1″ at the top. Attach the lids and rings, and tighten the rings by hand. 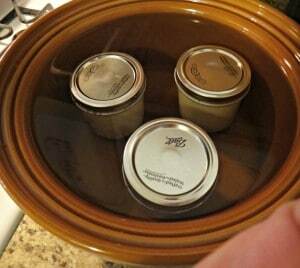 Place the sealed jars in your slow cooker and fill the crock with warm water. The water should be at least 1 inch above the jar tops. Cook on low for 8-10 hours, or until the milk turns a lovely caramel color. Carefully remove the jars from the slow cooker and allow to cool on a towel on the counter. Store in the refrigerator after cooled. Opened jars will keep about 2 weeks and unopened jars will keep for about 3-4 weeks. Be sure to check the water level periodically to make sure the jars are completely covered the entire cooking time. I usually start a batch in the evening (9:00ish) and it’s done when I wake up. If your Dulce de Leche is on the lumpy side, simply stir until it smooths out. Try heating up in the microwave for a few seconds if you want a warm sauce. Even though you may hear the lids “pop & seal”, the Dulce de Leche is not shelf stable and MUST be stored in the refrigerator. I have really hard water and noticed my crock and jars feel “gritty” after the cooking process. If you have this problem, simply dampen a paper towel with a little vinegar and run it over the surfaces to remove the hard water deposits. Equally divide the contents of the 2 cans of sweetened condensed milk between the 3 canning jars, leaving about 1" at the top. Attach the lids and rings, and tighten the rings by hand. - Be sure to check the water level periodically to make sure the jars are completely covered the entire cooking time. - I usually start a batch in the evening (9:00ish) and it's done when I wake up. 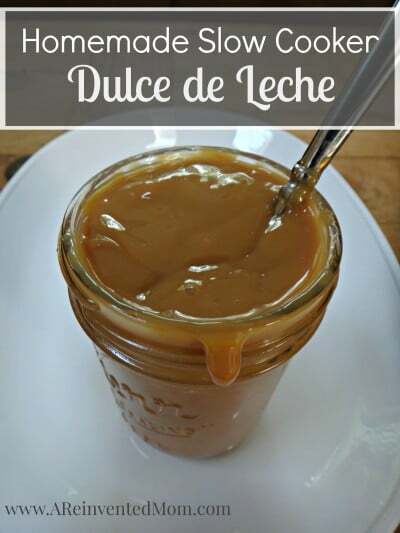 - If your Dulce de Leche is on the lumpy side, simply stir until it smooths out. - Try heating up in the microwave for a few seconds if you want a warm sauce. - Even though you may hear the lids "pop & seal", the Dulce de Leche is not shelf stable and MUST be stored in the refrigerator. - I have really hard water and noticed my crock and jars feel "gritty" after the cooking process. If you have this problem, simply dampen a paper towel with a little vinegar and run it over the surfaces to remove the hard water deposits. I just put mine in my crock pot! Beat cream cheese, vanilla and sugar. Stir in nuts. Serve with sour green apples and bananas and/or pretzels. Too funny – I have a batch cooking, too! Let me know how you like it. I’m going to have to try your caramel dip – just for research purposes, though (wink!). I love foodie research. Yum! Have you ever done the caramel dip from cream cheese and brown sugar? Just wondering how this compares…..Seems super easy!! I’ve never had the cream cheese & brown sugar caramel dip – sounds interesting, though. This is super easy and keeps for a couple weeks in the frig (if it lasts that long!). 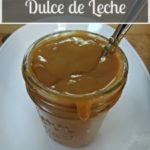 This is a great Dulce De Leche! Hope you have a great week and thanks so much for sharing your awesome recipe with Full Plate Thursday. Your post has been pinned with the party! Thanks – I’ll have to try it on toast (any excuse to eat this, right?!). Be sure to store in the refrigerator because it isn’t shelf stable.